Eli has been looking at the nexus between the tobacco, ozone, acid rain, climate change denialists. The tobacco case discovery documents are on line and have a treasure trove of stuff for anyone interested in the astroturf industry. A foolish Steve Hemphill is playing nyah nyah you can't prove it on Roger Pielke Jr.'s Promethius, so our crack team of prize winning long eared detectives have been trolling the archives. I spoke to Bill Hobbs about arranging an appointment for you with Dr. Fred Seitz, former head of Rockefeller University and the principal scientific advisor to the R. J. Reynolds medical research program. Bill told me that Dr. Seitz is quite elderly and not sufficiently rational to offer advice. Bill said that he would strongly recommend your speaking to Dr. Alfred G. Knudson Jr. of the CTR Scientific Advisory Board. You don't want to know what the people who have bought you really think. Curiously as one reads about climate change, ozone depletion, tobacco use, and just about any environmental issue, you find the same cast of "scientists" and "think tanks" on the denialist side of the argument. Probably because, like protomatter, no reputable scientist would want to be associated with that group. One of the key players is the Heartland Institute, who on the climate side run a web site called Climate Search. Eli was letting his fingers do the searching when he came across this letter (a very long one that starts about 1/2 way down on the page) from scottb, which pointed to this announcement on Climate Search. You are invited to attend a News Conference where, for the first time in Canada, a group of the world's leaders in climate science and energy engineering will be assembled to reveal the science and technology flaws of the Kyoto Accord. 1 - Dr. Tim Patterson - Carleton University professor of earth sciences (Paleoclimatology specialization). 2 - Dr. Fred Singer, President of The Science & Environmental Policy Project and Distinguished Research Professor at George Mason University and Professor Emeritus of environmental science at the University of Virginia. 3 - Dr. Tim Ball - professor of Climatology, University of Winnipeg and the first climatology Ph.D. in Canada. 4 - Dr. Madhav L. Khandekar, Environmental consultant. 25 years Research Scientist from Environment Canada. 5 - Dr. Pat Michaels - Dr. Michaels is a research professor of environmental sciences at the University of Virginia, visiting scientist with the Marshall Institute and Senior Fellow in Environmental Studies at the Cato Institute, both in Washington D.C.
Hmmm in a couple of cases. Why does the stratosphere cool while the troposphere warms daddy? One of the strongest and most consistent predictions of Global Climate Models is that if greenhouse gas concentrations increase, then the troposphere will warm. Another is that the stratosphere will cool. Both cooling and warming have been observed in the right places, but before we start, let us say that most of the currently observed stratospheric cooling is due to ozone depletion. To my knowledge no one has stated a simple first order explanation for greenhouse gas (ghg) stratospheric cooling. William at Stoat tried to do this, but his explanation is not simple. If you don't believe me go read. Talking over a carrot martini a simple explanation appeared between my ears. Thermal equilibrium requires that the TOTAL emission from the TOA (warning simplification) has to equal the solar energy flux into the atmosphere. Simply put, stratospheric cooling is driven by higher water vapor concentration at the TOA driven by tropospheric ghg warming. TOA IR emissions from water vapor are not absorbed in the bone dry stratosphere, IR emission from CO2 is very efficiently absorbed, and more so if the CO2 concentration increases. Ghg warming lead to higher water vapor concentrations. The proportion of the constant TOA IR emission from water vapor increases. Since none of this emission (warning simplification) can be absorbed in the stratosphere, the stratosphere cools. QED. 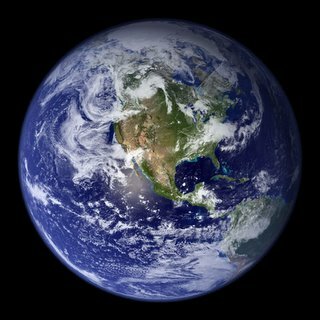 The image of Earth taken from the moon has become an icon, often referred to as the blue marble. NASA has a new site with truly breathtaking true color images taken from space, that can be accessed at the Earth Observatory web site. You really have to explore the site to enjoy its richness. Anyone reading "Taken by Storm" by Chris Essex and Ross McKitrick, needs a dictionary. In the best tradition of that Newspeak proverb, Ignorance is Bliss, you need your secret boys' decoder rings to read the book. Essex and McKitrick do provide an incomplete quack speak glossary, but how is one to tell what they are talking about without Dr. Rabett's amazing English - EssexMcKitrictionary? A comparison to Newspeak may arguably be seen in political rhetoric, where two opposing sides string together phrases so empty of meaning that they may be compared to the taunts young children toss back and forth. The arguments of either side ultimately reduce to "I'm good; he's bad." Doctrine of Certainty - the idea that anyone besides Essex (and maybe McKitrick) can know anything. Obviously false. Often called "The Doctrine" includes items that are "manifestly false or the claim to know it is false". The first tenet is that "The earth is warming". Well yeah, guys, it is. Official Science - The Convection of Certainty as conveyed to the public and policy makers by those ignorant experts who claim to know more than Chris Essex (and maybe Ross McKitrick) about climate. PUN - the Panel of the United Nations, aka the UN Intergovernmental Panel on Climate Change, known among humans as the IPCC. Here, Chris Essex (and maybe Ross McKitrick) move into deep Black Helicopter territory. ELGs - Environmental Lobby Groups aka NGOs organizations mislead by Official Science, the Big Panel and the SPAMS that actually think they have the right to petition their governments rather than take direction from Chris Essex (and maybe Ross McKitrick). The Doctrine of Certainty forged in the Convection of Certainty by Official Science and promulgated by the PUN through the Big Panel in the SPAM was taken up by the ELGs. Which actually is a bit better than Chris and Ross did! But both meet the requirements of Newspeak. That concludes Chapters 1 and 2 folks. The efficient way that Jim Hansen offed his PAO* carbuncle, George Deutsch, is acquiring considerable notice across blogland. On the surface this is a simple story of a wet behind the ears political appointee trying to impose his political and religious views on a noble scientist. If anything, Deutsch’s recent comments have made his agenda clear, and endeared him to the radical Republican party, while justifying Hansen’s actions to everyone else. Do not be surprised if Deutsch starts running for something in deepest Redland. What has been missed is the timing and skill with which Hansen did the job. The motives are, I think, clear: The attempt by the current administration to impose its politics on NASA earth science has ticked Hansen off and he has waited for his chance to make a statement. Deutsch was the immediate and easy target, but collateral damage was the purpose. NASA is not a particularly political agency, but it would be a mistake to think that internal politics play no role and that administrations have no say in the agency. Historically administrations do this by picking the Administrators and by selecting the Agency mission. Since NASA is chronically underfunded and has more missions than dollars, putting a focus in one area of necessity means taking resources away from another. To parse the recent dust up we need to look at the last two administrators, Sean O'Keefe and Michael Griffin. O'Keefe was a creature of OMB and a long time participant in Republican policy groups. His contributions to NASA were full cost accounting and the Space Exploration Initiative. The effect of both was to restrain the ability of NASA to do many of its missions, in particular the ones that the administration did not want it to do. Even looking at the budget does not tell the whole story, because many of the less favored programs were hard hit with taxes linked to supposed administrative costs under the full cost accounting scheme. Oh yes, the third thing was a reorganization that mashed Space Science and Earth Sciences together into a Science Directorate and de-emphasized it with respect to the new Exploration Systems Mission Directorate. Michael Griffin is a creature of the space industry, both civilian and military. He has worked with NASA and for NASA all of his professional life. Griffin's first move was to clean house at the top of the agency. Some may argue that it would have been better to keep one or the other of the top 20 appointed by O'Keefe and encouraged to leave asap by Griffin, but there was remarkably little push back. The final piece of the puzzle is the nature of the snakepit. The following excerpts are taken from GSFC's mandatory career management online training required for all GSFC civil servants. Unwritten rules are norms for behaving and performing successfully at GSFC that are not printed in any Standard Operating Procedures Manual or Employee Handbook. When an employee understands and adheres to GSFC's Unwritten Rules we call them politically savvy. Nothing can derail a career more quickly than a lack of political savvy. Now the lab that Hansen directs, GISS in New York City is an odd duck in an organization chart. Formally it is merely one of four labs in the Earth Sciences Division of the Science and Exploration Directorate at Goddard Space Flight Center, Greenbelt Maryland, and Goddard is one of ten NASA labs sited around the US. The director of Goddard, Ed Weiler, reports to Griffin in the new organization chart, but used to report to the Associate Administrator for Science, Mary Cleave. Weiler is a serious astrophysicist, Cleave was an astronaut, and a professional earth scientist. In organization speak, there are at least four people between Hansen and Griffin. ALL OF THOSE PEOPLE INCLUDING GRIFFIN HAVE STRONG EARTH OR SPACE SCIENCE CREDENTIALS. What is more, GISS has always been more independent than the organization chart implies, with many of its own programs and a relationship with Columbia that gives it much of the intellectual freedom that JPL enjoys through Cal Tech. GISS is both a NASA lab and a part of the Earth Institute at Columbia. Update: I forgot to leave links to what Hansen says about climate change and how to meet its challenges. Here is the text of his talk at the AGU session in honor of CD Keeling, and here is an article in Proceedings of the National Academy of Sciences which first set forth his ideas. James Hansen, Head of NASA/GISS, has been in the news lately. He has been on just about every blog you can name also after Andrew Revkin in the NY Times wrote about how some Jr. Bush ranger in the Public Affairs Office at NASA/HQ has been trying to control what Hansen says. 3. Jim Hansen’s statements about “policy” are really just political exhortations, and not really about policy in any significant degree. The climate issue is in gridlock and it is inconceivable that (yet another) prominent scientist witnessing to his political values is going to change these dynamics, even if it offers some short term discomfort for the Bush Administration. 4. Jim Hansen’s statements had their 15 minutes of attention and were largely old news – the Bush Administration has turned a non-story into renewed focus on their approach to climate. Hansen is old hat and not RP Jr., so what does he have to say, while Sr. just wants to give Hansen the third degree. The quote credited to me in the random samples item "Ice ages as history" (23 Dec. 2005, p. 1900) ("Anthropogenic climate change will basically produce another planet .…Earth won't have another ice age until humans go extinct.") was constructed from two statements that I made at the 6 December 2005 meeting of the American Geophysical Union: "business-as-usual scenarios will produce basically another planet" and "another ice age cannot occur unless humans become extinct." The printed construction provides no hint of my conclusion that large climate change can be avoided via a scenario that includes action to improve energy efficiency and reduce non-CO2 climate forcings. These actions require strong policy leadership and international cooperation, but they have multiple practical benefits for the environment, human health, and economic development. I suggest (my talk is available at www.columbia.edu/~jeh1) that special interests have been a roadblock to this end, wielding undue influence over policy-makers. The public has the power to override special interests, but scientists need to communicate the full climate story to the public in a credible, understandable fashion. I f you have not yet read the talk, go do so. The AGU must hate Roger Pielke Jr.
Park chooses to go after cheap political points rather than engage the real substance of policy issues involving the convoluted and controversial history of Triana. Park bemoans the termination of Triana and asks ominously, "Why did NASA kill a climate change project?". He suggests a sinister conspiracy within the Bush Administration to "avoid the truth about global warming" and to transfer their "hated" of Al Gore onto the project he first proposed in 1998. While perspectives on Triana are no doubt shaped by its unique origins, the reality is that has never occupied a high priority role in reseach priorities set forth by the climate science community, its costs ballooned and took resources from other earth and space science programs that had gone through community peer review, and it required a space shuttle flight of which there are exceedingly few left. To derive ideal estimates of the Earth's reflectance, it would be necessary to observe reflected radiances at all angles from all points on the Earth, which is technically impossible. Therefore, all measurements from which albedo can be inferred require assumptions and/or modeling. during recent decades, there have been some efforts to measure the Earth's albedo from space; but a long-term data series of the Earth's albedo is difficult to obtain due to the complicated intercalibrations of the different satellite data and the long gaps in the series. They go on to discuss whether the Earth's albedo has increased in the past decade (maybe) and how this could be reconciled with global warming (possible). Interesting article important problem, and it is very clear that we have a tenuous grasp on the measurement of the albedo, at least to the accuracy needed. And what does the article say about DSCOVR? The satellite would provide a continuous synoptic view of the Earth and facilitate climate science by measuring energy reflected (albedo) over an entire hemisphere. No other satellites can currintly obtain these measurements, which are needed to determine the effect of albedo on climate, according to DSCOVR principal investigator Francisco Valero of UCSD Scripps.